Equity investors began their celebration immediately after the November elections. On the other hand, fixed income investors made an initial exit from the bond market only to cautiously creep back in after November’s shock. The markets were reacting to President Trump’s determination to “make America great again”, partly by reviving an economy that never was able to fully recover its momentum after the Great Recession of 2008-2009. While a bit off of its closing high on March 1st of 2395.96, the S&P 500 has risen 13.3% from a closing low of 2085.18 on November 4th to end the first quarter at 2362.72. The Barclays Aggregate Bond Index dropped approximately 3.5% from its pre-election level to its bottom in mid-December. It has since recovered 2.2%. Interestingly, the stock market has begun to falter ever so slightly as the Republicans’ failure to repeal and replace Obamacare has caused second thoughts about their ability to reshape the economy, especially through broad based changes in tax policy. The reasoning seems to be: “If they can’t agree on something that touches 14% of the US economy, how will they be successful on taxes which touch every aspect?” Only time will reveal their ultimate level of success. As has been the case over the last months, the economic outlook is not without a mix of positive and negatives. 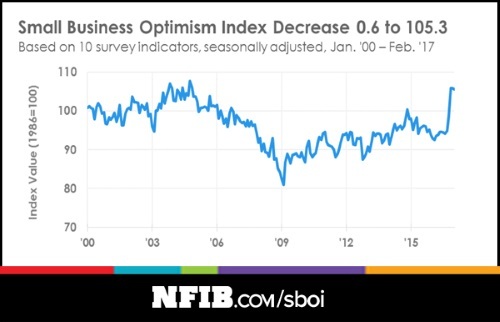 Consumer confidence is at its highest level since 2000, and small business confidence remains high and at levels not seen since before the financial crisis. The Federal Reserve is confident enough to have raised rates in March and is talking about ongoing rate hikes over the course of the year. Nonetheless, there are some signs of possible trouble ahead. Retail sales remain weak, with the latest report showing just a 0.1% rise. Prices of used cars are in steep decline and manufacturers are offering large incentives to move new cars off the lots. Meanwhile, pending sales of existing homes reversed course to rise sharply (+5.5%) but were outdone by new home sales (+6.1%) and new home construction (+6.5%). Conversely, multifamily starts fell 3.7%. Demand for oil looks to be somewhat weak as evidenced by recent oil price drops. Ominously, we have also seen the biggest jump in unemployment claims in six months, yet today a very strong jobs report showed companies added 263,000 to their payrolls in March, far surpassing the 185,000 expected. Our conclusion is that while economic reports are a bit muddled, we don’t see much risk of an imminent recession. Despite looming interest rate increases, long term bond prices rose in the first quarter and short term bonds fell. The fixed income holdings in your portfolio were up a respectable 0.41% with the government holdings detracting from a stronger showing by the portfolio’s corporate bonds. The stock market did finish a consolidation phase in late January and continued its upward move to reach new highs. Valuations remain stretched, but the market has already had a minor correction in the wake of the healthcare reform debacle and that may be all we get for a while. In all likelihood, as long as a generally positive view on government reforms and modest rate hikes stays in place and corporate earnings don’t disappoint, we would expect the stock market trend to remain upward. The stock market shifted gears during the third quarter as investor concerns over the economy faded. As a result, growth oriented equities (like Technology stocks) moved from the worst performing (-2.84%) economic sector during the second quarter, to the best (+12.9%) during the third period. And because higher inflation and interest rates are highly correlated with faster economic growth, interest rate sensitive stocks such as utilities and telecom issues both declined almost 6% during the quarter. Third quarter corporate earnings came in above estimates and interest rates started an uptrend which accelerated over the next several weeks. The S&P 500 stock index increased 3.85% while the bond market, based on Barclays Intermediate Government Corporate Index, increased 1.21%. Despite the near complete absence of fiscal stimulus, the economy showed good improvement during the third quarter and given the recent strength of the stock market, investors appear to be betting that the improved trend will continue. Corporate profit growth improved in the third quarter and forward earnings estimates rose to a record high during the first week in October. The CRB raw industrial spot price index has recovered smartly of late. That’s good news since there’s a very strong correlation between the level of inflation and earnings growth. Jobless claims are at their lowest readings since 1973 and wages are beginning to improve which should support higher levels of consumer spending going forward. Finally, history shows that the absence of political gridlock in America has been good for economic growth and stock prices no matter if it be Democrats or Republicans in control. As always, we value your business and our relationship with you. Please don’t hesitate to call if you have any questions or comments, or if there’s any way in which we can be of service. To say that the past three months have been a volatile period for the market is not an exaggeration. With terrorism in the background, oil prices plummeting, negative interest rates in Europe and Japan, and economic growth in question throughout most parts of the world, January got off on a terrible note, sending the Dow to its worst 10-day start to the year on record going back to 1897! Although the market began to turn back up during the latter part of January, it started to decline sharply again in early February, eventually bringing the market down to a year to date total return of -11.4% by mid-February. Fortunately, the fears of an economic meltdown gradually dissipated from that point on and the market actually ended the quarter up a modest 1.35%. Nonetheless, the first quarter was one of those nervous market periods where so-called defensive stocks (as opposed to growth stocks) took their place on the leader board given the perceived stable nature of their operations. The Consumer Staples stock group (Proctor & Gamble, Coke, Clorox, etc.) is a perfect example of defensive type stocks. This sector accounted for 47% of the gains reported for the S&P. On the other end of the spectrum, Consumer Cyclical stocks ranked near the bottom during the period in terms of returns. In the end, what matters most to investors is that economic growth remains healthy enough to increase consumer paychecks and grow corporate profits within a reasonable inflationary environment. The stock market began to move higher again in mid-February in response to what turned out to be an improvement in U.S. economic conditions. In addition, inflation is beginning to move higher and, excluding food and energy, is close to the Federal Reserve’s 2% objective for perhaps the first time since the stock market began to move higher in 2009. The velocity of money is also beginning to improve (+8%) which means the economy is finally making use of the extra money the Fed has been printing over the past several years. Barring a rash of terror attacks, talk of interest rate hikes, or another hit on oil prices, the investment environment should be OK for at least the short term. Having finally taken the plunge to initiate a cycle of rising interest rates, the question uppermost on many investors’ minds is whether or not the Federal Reserve will follow through and continue to raise rates over the course of 2016. While the recent performance of the US economy is less than uniformly supportive, policy makers indicate that they believe it is strong enough to support increasing rates. But there is more to consider than just the domestic economy. As you know, with the advent of the internet, instantaneous global communications, and increased cross border trade, no single country is immune to what is going on in the world around it. We have seen a significant slowdown in the growth of the Chinese economy, collapsing commodity prices (particularly oil), and a startling drop in international freight rates and traffic. On top of these fundamental issues, there are political issues including terrorism and huge immigration flows into Europe (and the US). Interestingly, the Fed is caught in something of a lose – lose position from a market perspective. If it continues to raise rates, investors may view that as too much of a headwind for securities prices. On the other hand, should the Fed back down from rate increases, that climb down may well be interpreted as a lack of confidence in the economy, both at home and abroad. One thing that we can be reasonably sure of is that, should the Fed continue on its course toward normalization of interest rates, the necessary increases will be slow. Under either scenario, a low rate environment is expected to persist for some time. The stock market repeated its August swan dive in December driven primarily by declining oil prices and China fears. This drop, unfortunately, was not enough to enable your Rydex fund holding to remain above its end of September value. For the quarter, it fell 7.34% and 4.39% for the full year. Fixed income holdings also show a negative yearly return of 0.66%. This reflects the effects of the rate increase as well as investor aversion to anything but the very highest quality issues.